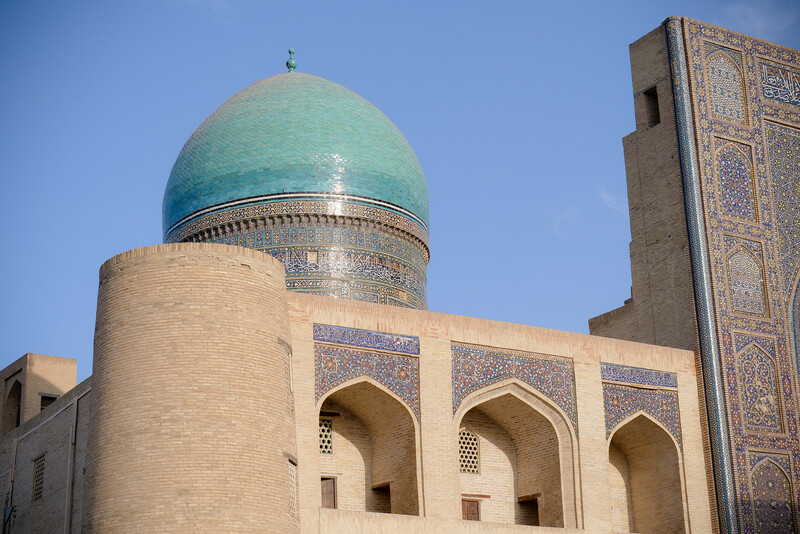 Uzbekistan in Central Asia is home to an enchanting land of Silk Road history, massive portions of food, and a heart-warming culture of hospitality. I had the privilege to travel to Uzbekistan with the Ministry of Tourism (thank you Bekruz! 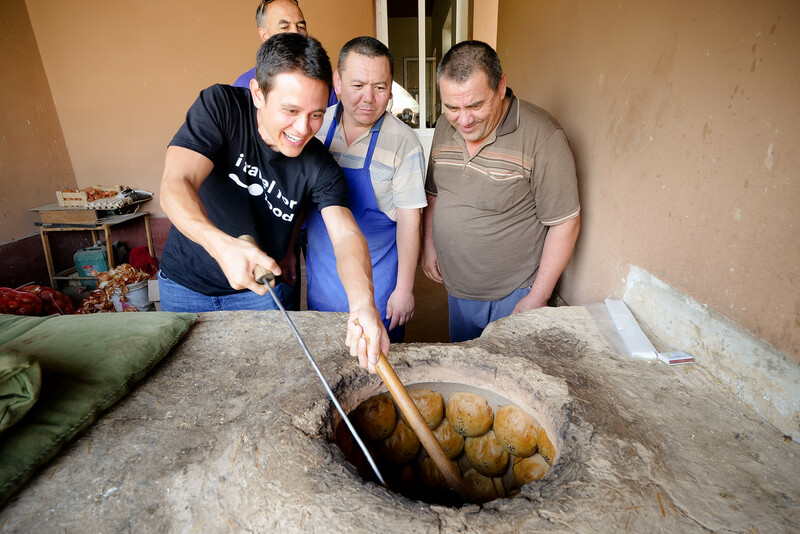 ), learning about their immense history, and experiencing Uzbek food and culture to the fullest. I’m going to share the highlights with you right now. You can also watch the entire series on video here. 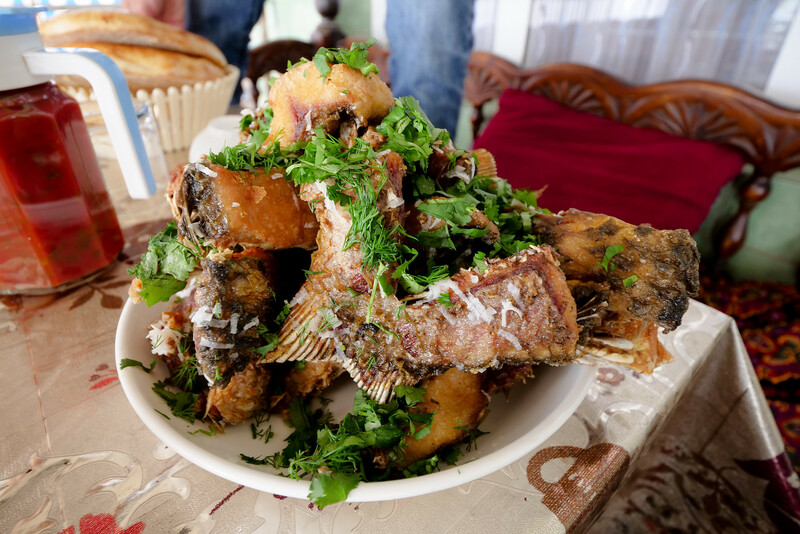 NOTE: This does not include every meal and detail about my trip to Uzbekistan, but it’s the main highlights, the top food and experiences I had during my trip. From Bangkok we flew to Tashkent, the capital and largest city of Uzbekistan. Tashkent is an ex-Soviet city in Central Asia with a history of destruction and re-building multiple times, from both foreign conquerors and earthquakes. I was immediately surprised how clean, green, and spacious Tashkent is. During our time in Tashkent, we stayed at Wyndham Tashkent hotel, a nice base, and their breakfast was amazing. 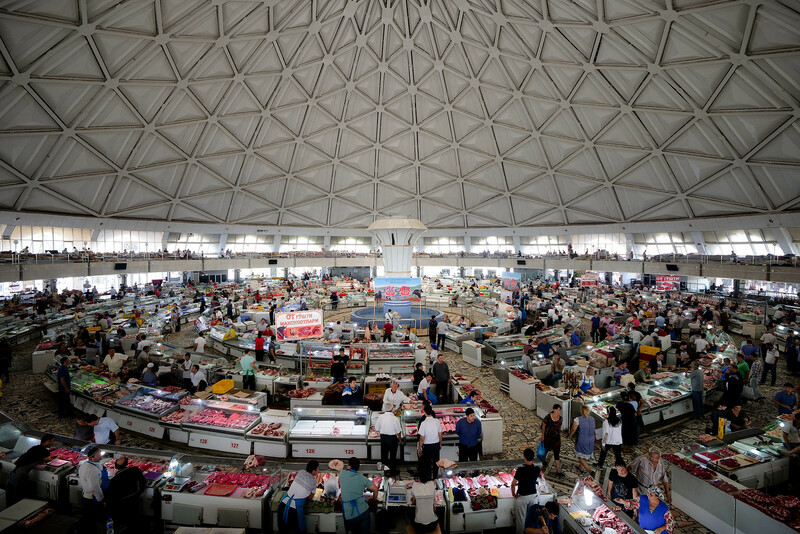 Chorsu Bazaar, the massive traditional Uzbek market, is one of the best places to immerse yourself into the culture of Tashkent. 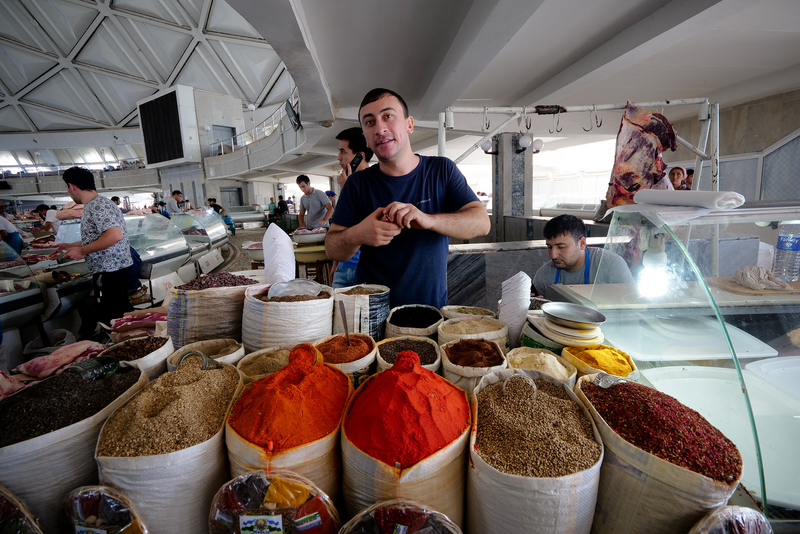 It’s a feast for the eyes of fresh meat, spices, fruits and vegetables, and everything else produced in Uzbekistan. The dome structure of the market is iconic, and reminds me of a stock exchange floor, a museum of a market. In the food court section of Chorsu Bazaar you’ll find an array of ready-made food to consume. The lady in this photo has been making these dumplings for over 25 years. She uses a noodle like wrapper, stuffs them with thinly julienne potato, then smothers them in tart tomato sauce. Plov (pilau) is the most beloved food of Uzbekistan, a combination of rice, meat, usually carrots, oil, and seasonings. 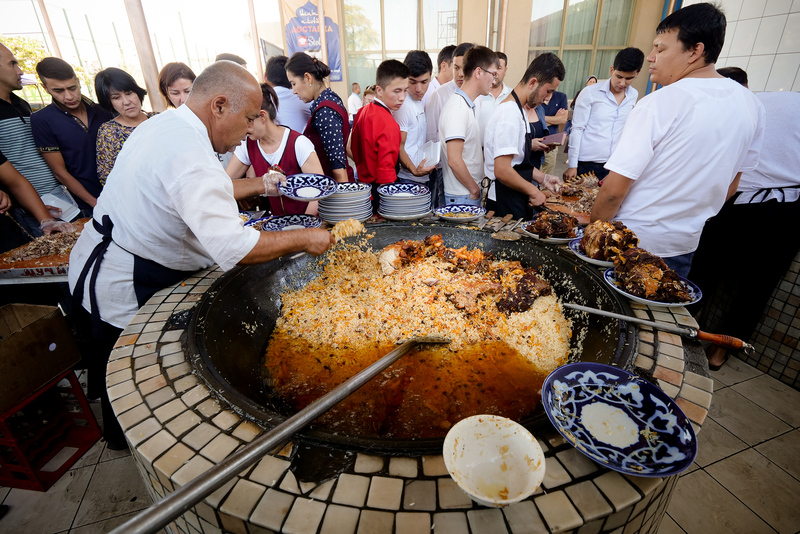 In Tashkent, the place to go for plov is the Plov Center, an opera house like restaurant that prepares 1,500 Kilos of plov per day… and sells out in a couple hours! 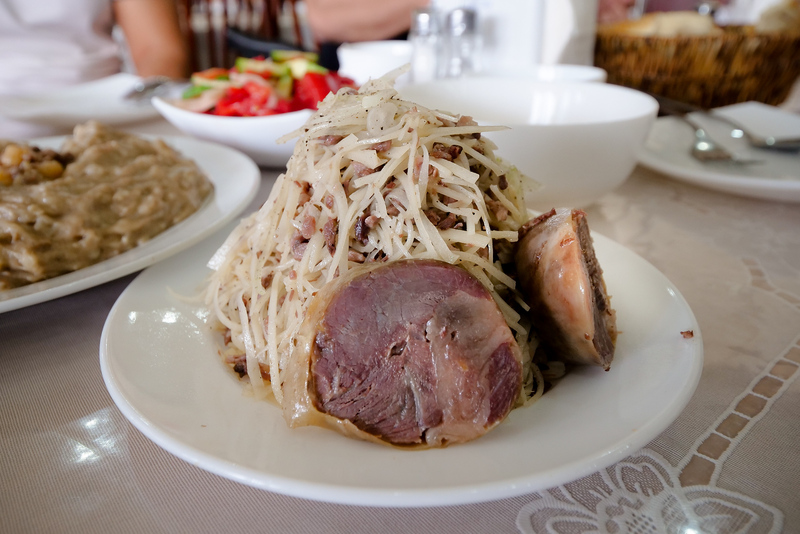 Naryn is a popular dish in Tashkent. Made with very thin slices of uncooked dough, its then hand-mixed with minced meat. Also including spices like cumin and pepper, its finally topped by a couple slices of qazi, horse meat sausage. I thought it was one of the more unique dishes of Uzbekistan. Tashkent is an amazing city to walk around, so green and clean, with huge wide open spaces and sidewalks. 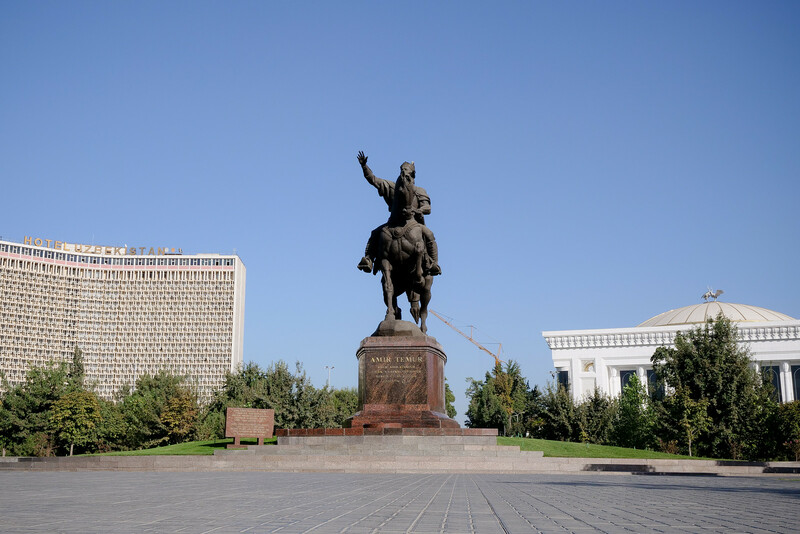 One of the landmarks is the statue of Amir Temur, one of the greatest conquerors of Central Asia. Behind, the iconic Hotel Uzbekistan, a remnant of Soviet architecture. I don’t think I went a single day, during my entire trip to Uzbekistan, without eating at least one or a few somsa (or samosa). This pocket of dough filled with mutton and spices is the most common snack or light meal in Uzbekistan and across Central Asia. 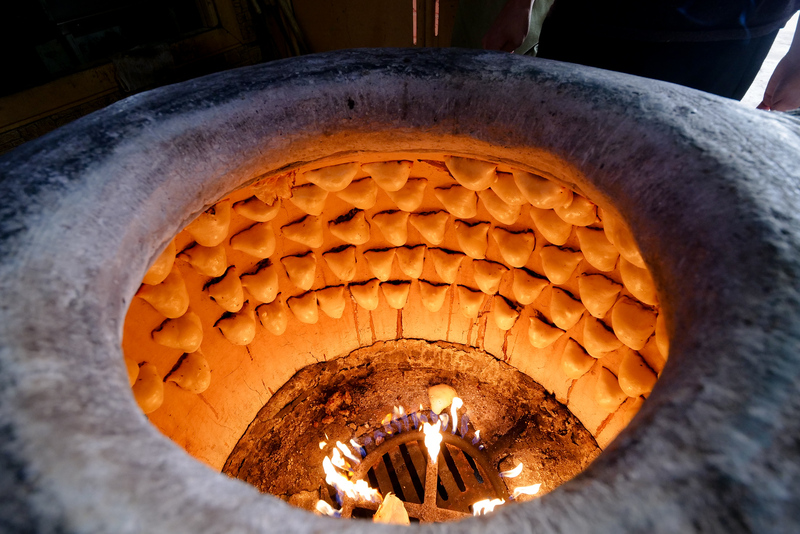 Known for their teardrop shape as they droop into the tandoor oven, Somsa Minor was the best I tried. In Uzbekistan a Choyhona is a part of the social and hospitable culture. It’s not a restaurant, but you bring your own food (they do have cooks there too). It’s a time to socialize with peers, talk about serious issues, and feast on usually quite manly foods. It was an honor to be invited to a Choyhona, a feast spreading across the table. The main dish was an entire oxtail, stewed in its own fat. It was one of the most memorable Uzbekistan travel and cultural experiences I had during my trip. Thank you to Baha and Rashad for organizing it. The journey continued, and from Tashkent we drove to Samarkand. It’s about a 4 hour drive if you don’t make 4 food stops like we did. 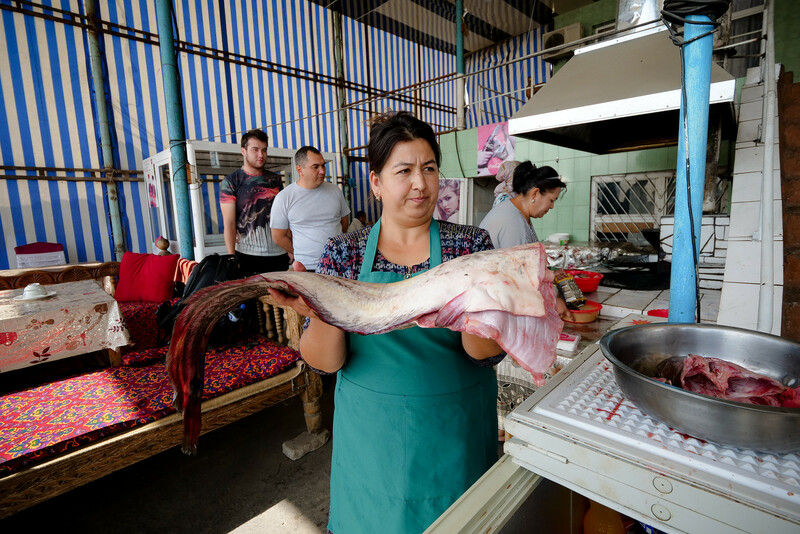 Along the way, we stopped at Chinoz Fish Market, a series of freshwater fish restaurants known by fish lovers throughout Uzbekistan. The carp was chopped into pieces and deep fried. Then, in a cooking move I’ve never seen anywhere else in the world (wait till you see the video, coming soon), right out of the hot oil, she sprinkles it with garlic water as it hissed. Finally a handful of dill and cilantro make this dish complete. Many varieties of melons originate in Central Asia, and Uzbekistan is known to have some of the sweetest melons in the world. 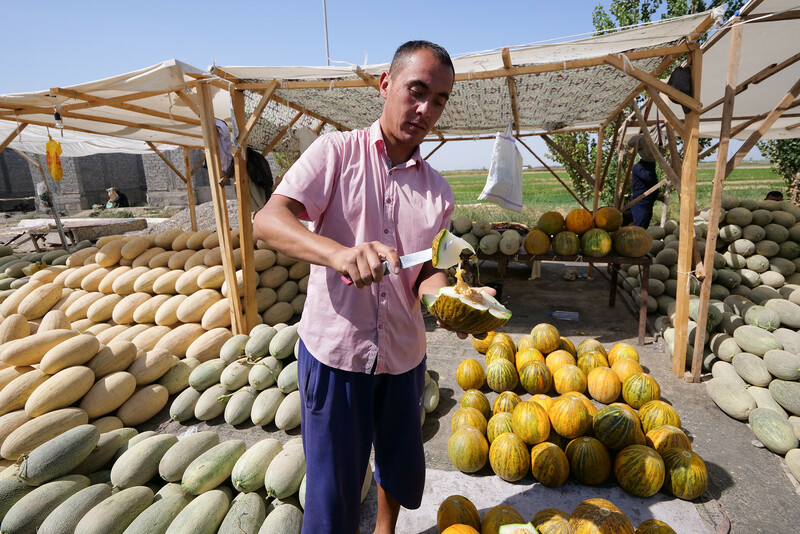 In-between Tashkent and Samarkand you’ll see melon markets on the side of the road, and not stopping to slurp down some melon would be horrible. Next stop on the road trip: somsa. I had the chance to pluck my first somsa from a tandoor oven. That was fun, and actually harder than it looks to get it out of the oven nice and clean. They really stick to the hot clay oven walls! 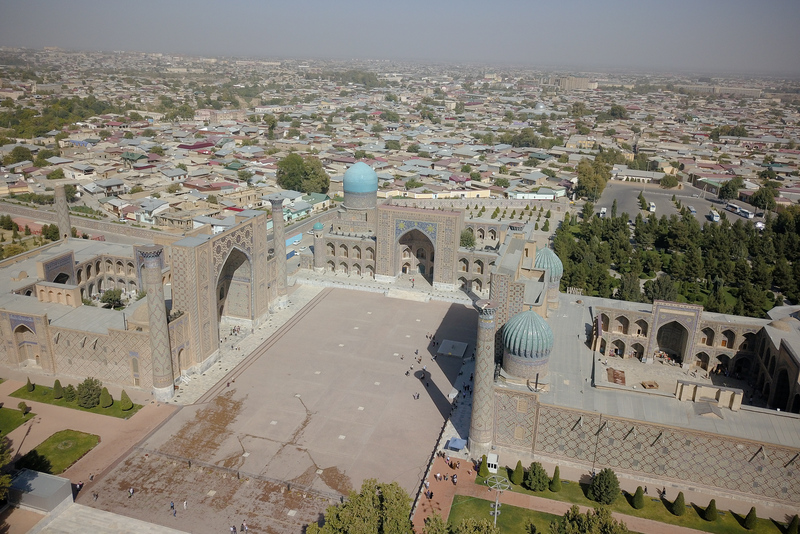 Continuing the Uzbekistan travel guide highlights, we arrived in Samarkand – an ancient city with some of the grandest historical sites in the country. This is where the magnitude of history starts to hit you, a city that was conquered by both Alexander the Great and Genghis Khan. We stayed at the DiliMah Premium Luxury pink and purple plush hotel, music was a little loud at night, but overall ok. 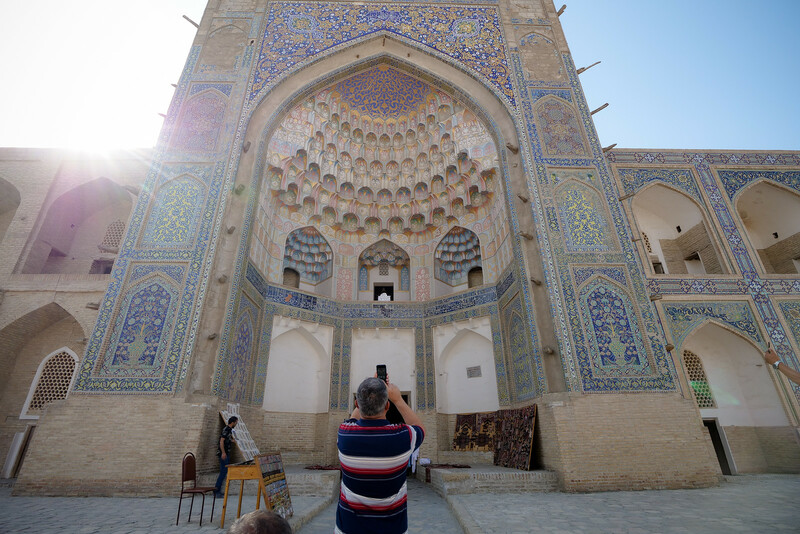 Check out my Samarkand guide here. 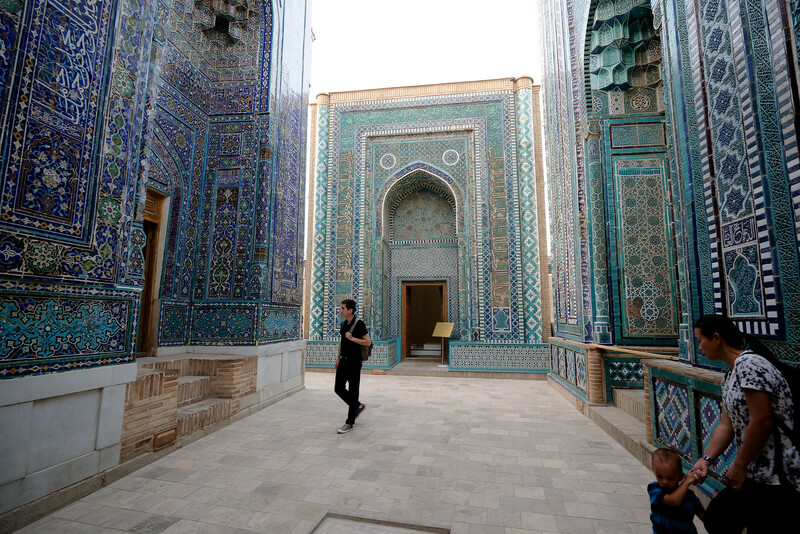 Registan is the ancient section of Samarkand, a courtyard of Islamic schools and Mosques, once a site of trade and bazaars along the Silk Road. The outside is spectacular, but step inside and the detail and preservation will blow your mind. In addition to history, Samarkand also had some of my favorite food in all of Uzbekistan. Again, you can’t go to a city in Uzbekistan and not try their version of plov, and Samarkand had my personal favorite version – braised in flax-seed oil, a layer of caramelized carrots, and sprinkled with tender meat. At Osh Markazi restaurant, they served us on a massive communal platter, and it was one of the greatest Uzbek food moments of my trip. 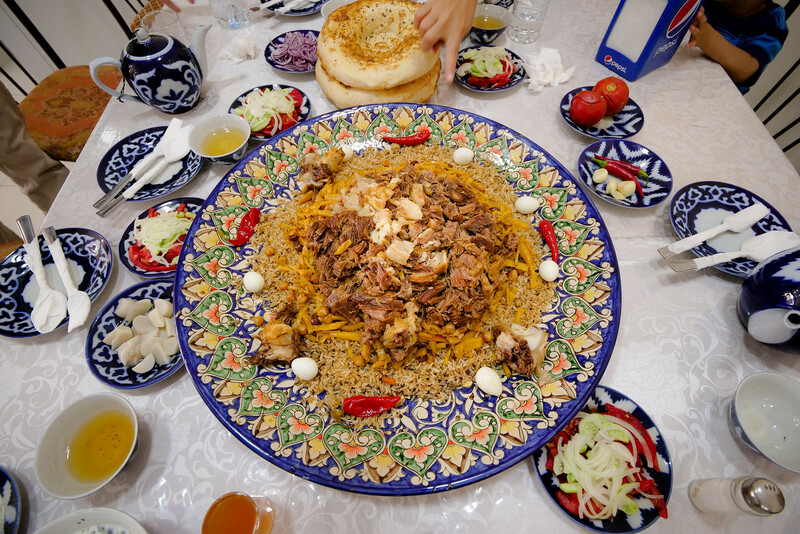 When you travel in Uzbekistan you don’t want to miss Samarkand plov. 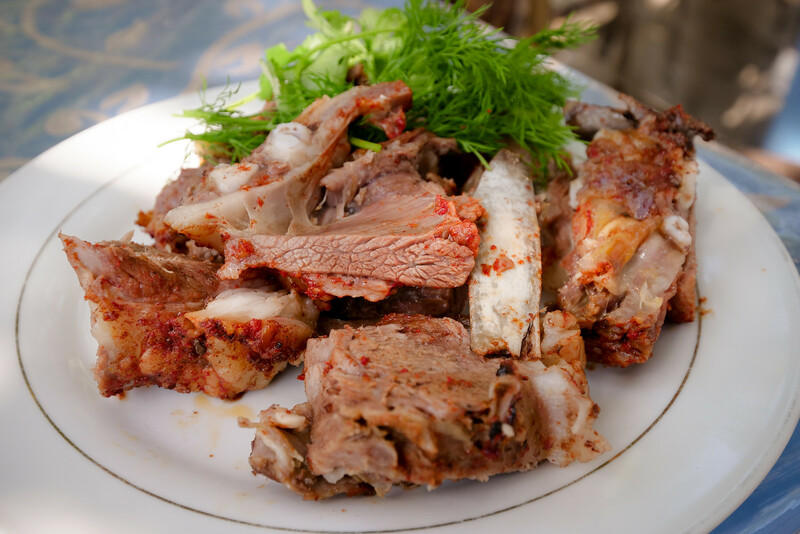 Let’s not forget the meat… in Uzbekistan you will eat a lot of meat – mutton and beef are the two most common. 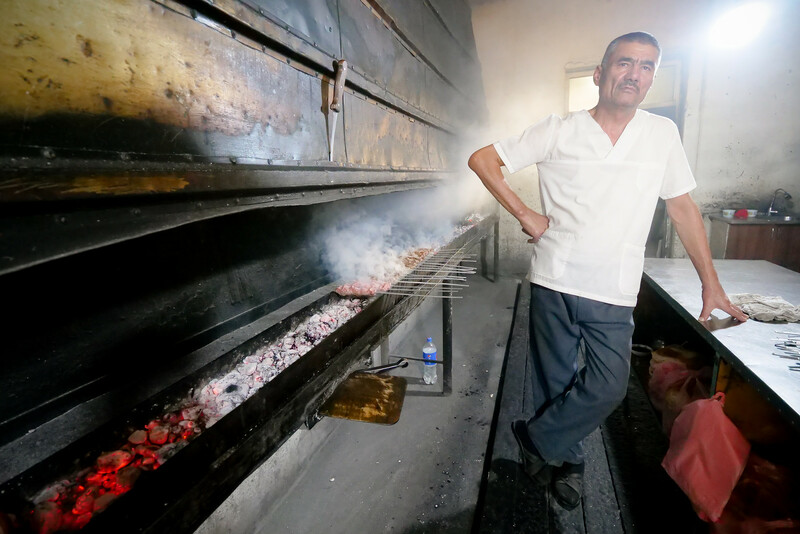 He’d been the boss of the grill at Ikrom Shashlik for over 20 years, and though without a hint of a smile, his mastery of grilling shines. Without a doubt, they were the best kebabs I had in Uzbekistan. Notice the kebab on the far left, thin slices of alternating mutton meat and fat, grilled to perfect umami smokey juiciness. 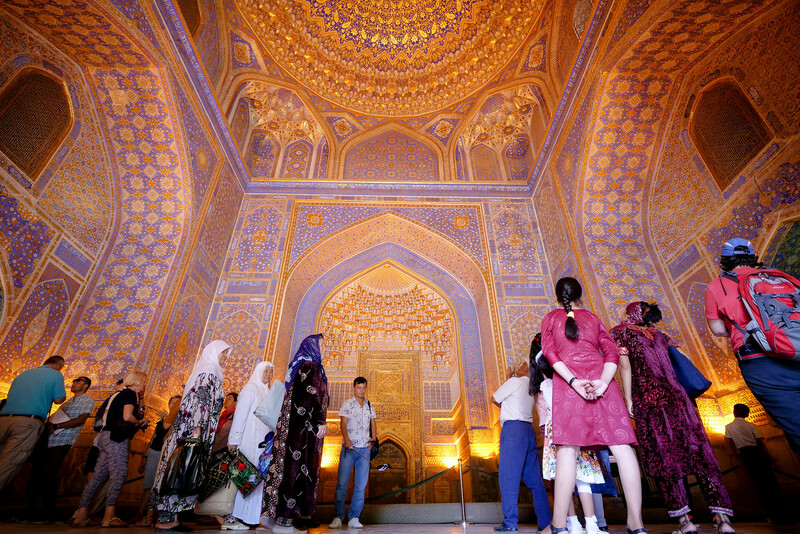 Shah-i-Zinda, a series of mausoleums decorated in an incredible mosaic of turquoise, is one of the most spectacular sites in Samarkand. From Samarkand we continued our travel through Uzbekistan, driving to Bukhara. It was about a 5 – 6 hour drive. Bukhara is an ancient city of World Heritage, and was a hugely influential trade point along the Silk Road. The entire center of the old city is filled with ancient buildings, mosques, madrassas, and bazaars. Huge turquoise domes glisten in the sunshine and dominate the skyline of Bukhara. It truly is a special and very memorable sight to behold. Easily the most impressive site in Bukhara to me though, was the Kalyan minaret. It reaches 48 meters high, and was built in 1127. It’s spectacular, and even Genghis Khan spared it from destruction. For breakfast in Bukhara we headed to the bazaar, a sprawling market with a section for everything. A friendly couple of ladies invited us to eat at their stall (it wasn’t actually a restaurant, they just had a table for themselves in the back), where we dug into rounds of fresh bread and kaymak, thick and creamy clotted cream. All the food was wonderful, but perhaps the culinary highlight of Bukhara was the tandoori lamb experience at Chor Bakr. 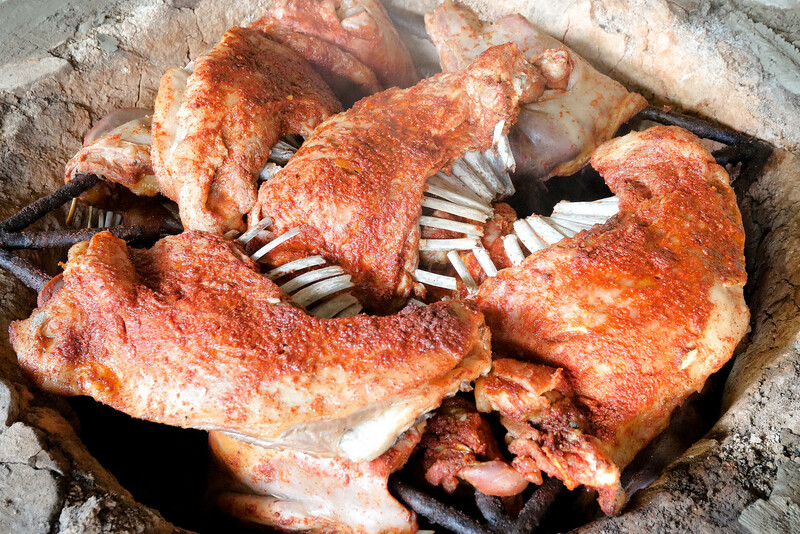 They pull it out of the blazing tandoor oven, lamb meat barely still clinging to the bone. It was so tender you could grabs chunks of meat by the fistful. The lamb was tender and crazily juicy, marinated and rubbed in paprika and juniper. 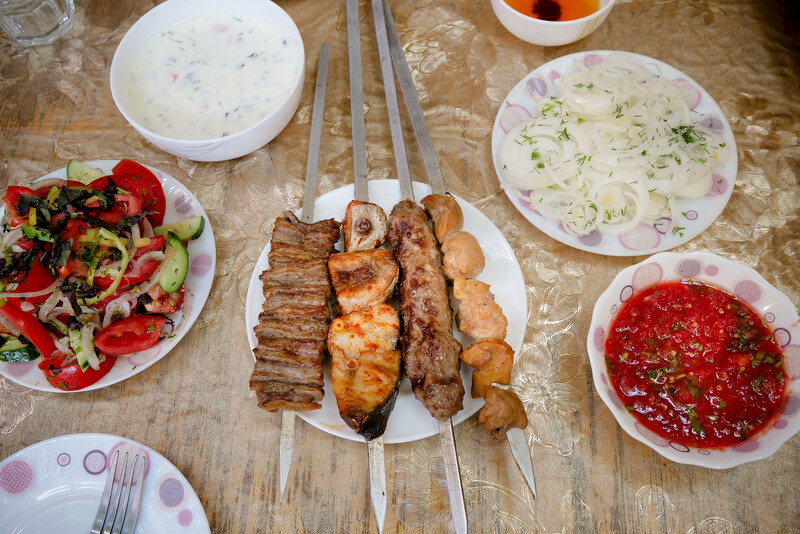 It was spectacular, and one of the best meals in this Uzbekistan travel guide highlights post. The final city we visited on our trip to Uzbekistan was Khiva, a city with layers of history and buildings that have been built and rebuilt numerous times. Khiva is know for its sheep wool hats, worn in the winter to keep warm, and also in summer, to keep the sun out of your eyes. 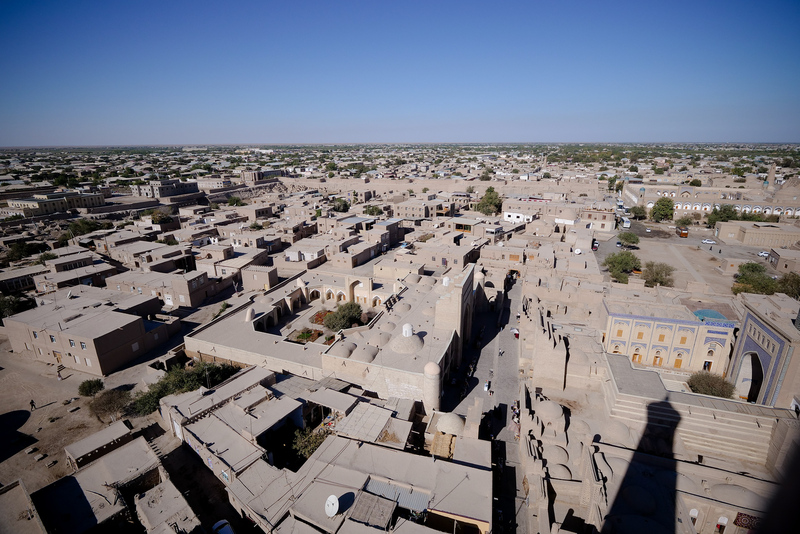 One of the coolest things about Khiva is that you can climb to the top of one of the main minarets for a view. It was worth the view, a cool and unique experience, and I had sore thighs for the rest of the day. The center of the city was a little on the touristy side, but the mud brick city was charming. 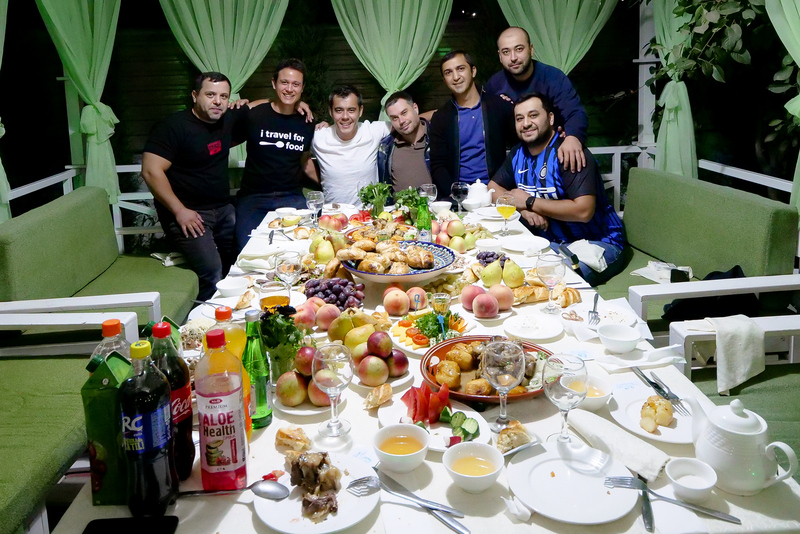 Later on, it was an honor to have one of the greatest Uzbek cultural and hospitality experiences of the entire trip. 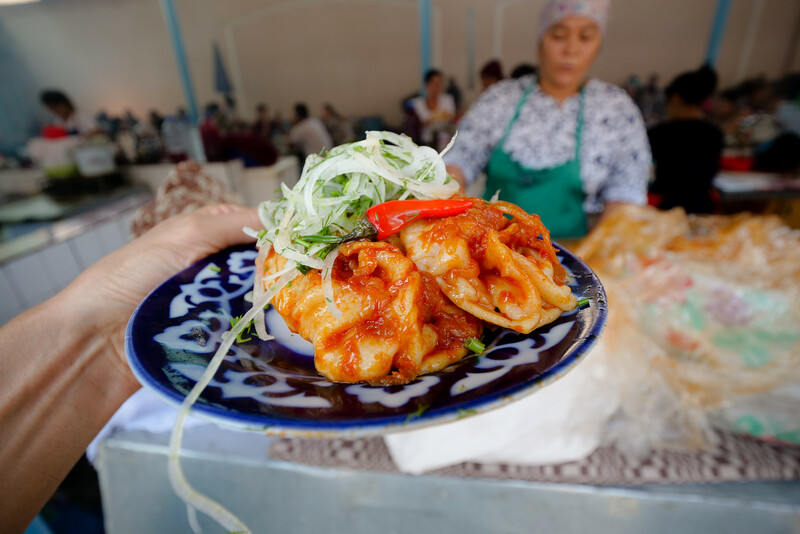 The food in Khiva was totally different from the other parts of Uzbekistan that I had visited, and made use of more herbs and vegetables – possibly due to the rivers nearby? 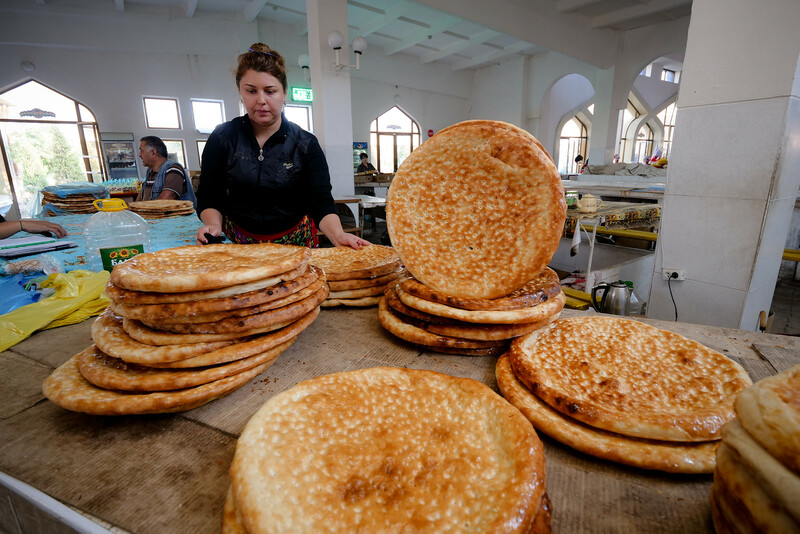 Shivit oshi is a specialty of Khiva and they make a good version at Tea house Mirza Boshi. 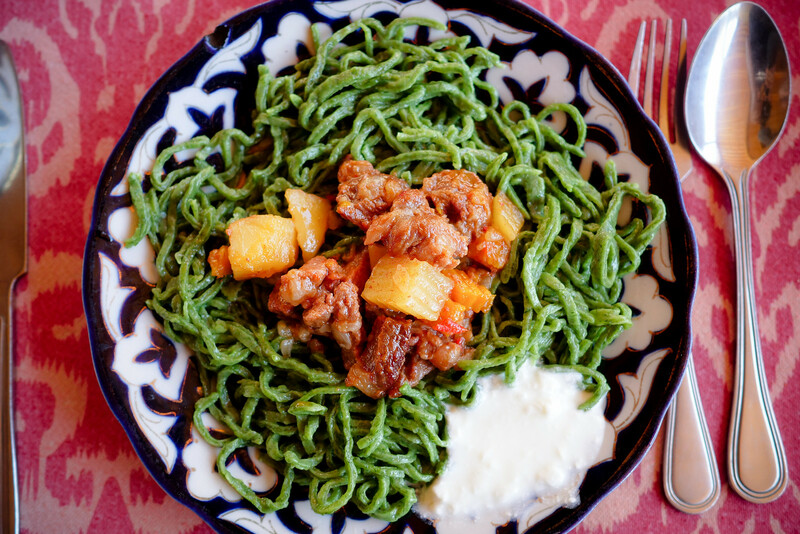 The greenness of the noodles comes from dill, it is topped with a beef stew, and then served with a side of cooling yogurt. 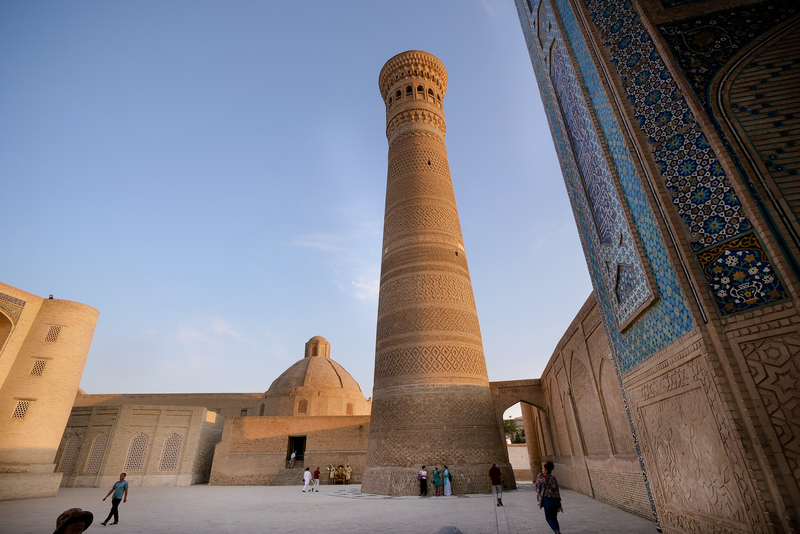 One of the highlights of visiting the old center of Khiva is Juma Mosque, which is now a museum. 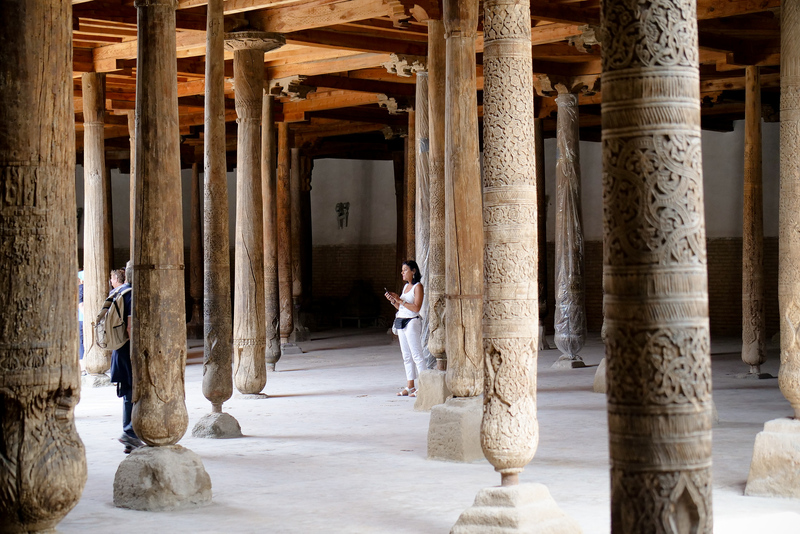 There are 218 wooden columns, a few of them dating back to the 10th century when it was originally constructed (however the mosque was rebuilt in the 18th century). 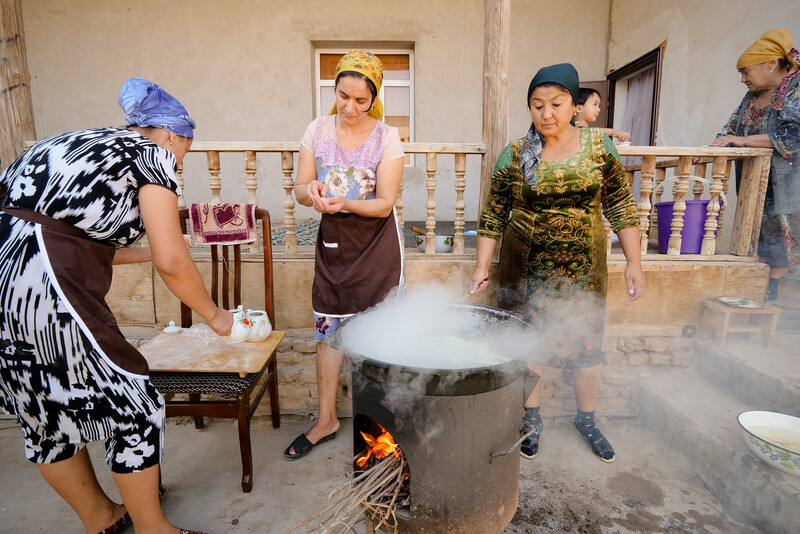 Being invited to cook and eat at a local home in Khiva was an example of the incredible Uzbek culture and hospitality. 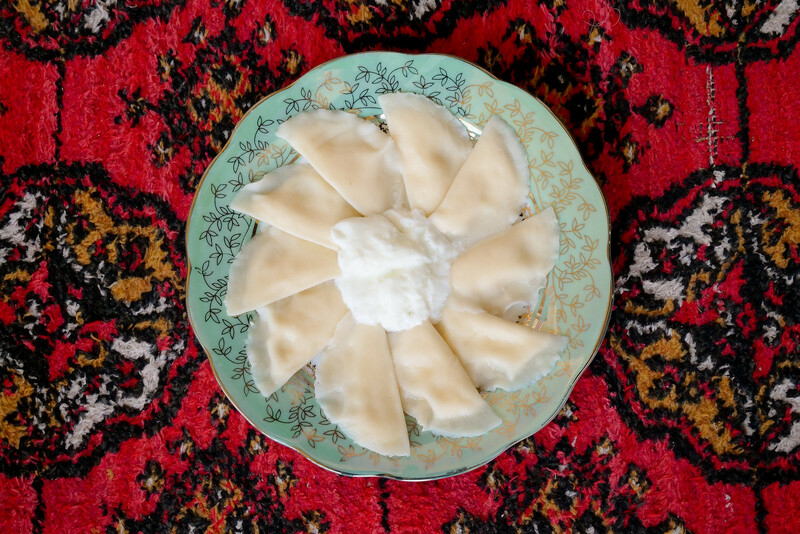 The Aunties prepared egg dumplings, a specialty in Khiva. They rolled the dough, then molded them into small jiaozi sized dumplings, but then came the most unique part of the entire cooking process. They poured an egg mixture into a tea kettle, filled the little dumplings with the egg liquid, sealed them, and dropped them directly into boiling water. The egg was sealed inside the wrapper, and finally paired with a spoon of yogurt when served. 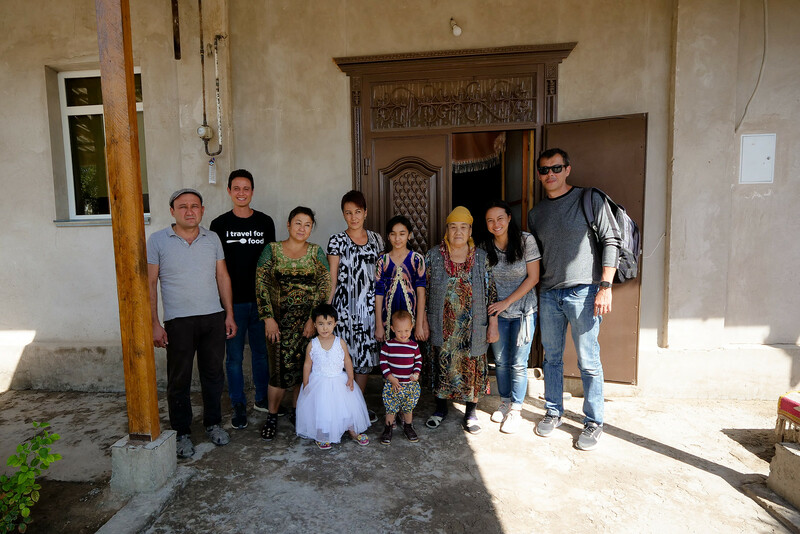 Sitting in their home, eating home-cooked egg dumplings, was a highlight not only in Khiva, but in my entire trip to Uzbekistan. And that wrapped up our trip to Uzbekistan. 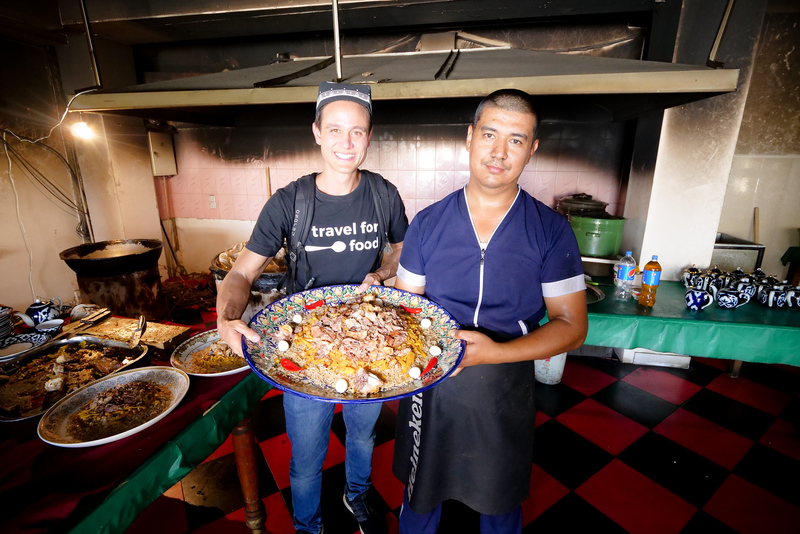 Again, this is hardly an exhaustive post, but in this simple Uzbekistan travel guide I’ve highlighted a few of the experiences, people, and food that stood out to me – the memories and flavors I’ll never forget, and the hospitality from which I have simply so much to learn. Sums up an amazing trip! Thank you to the Tourism Ministry of Uzbekistan for inviting and funding my trip to Uzbekistan, and specifically Bekruz for initiating everything and organizing my entire trip. Hope this gives you some ideas and insights into a fascinating country, beautiful culture, and delicious food in Uzbekistan. 85 comments. I'd love to hear from you! We heading to Uzbekistan this year, we can’t wait to try Ikrom Shashlik! The meat he is grilling looks incredible!!! Yummy! Looks like you had an amazing time eating your way around the country – that tandoori lamb sounds especially delicious! I loved munching on the eggplant salads and shivit oshi while I was there, but looks like I missed out on some seriously delicious dishes! Loved the video on Uzbekistan!!!!! I have always wanted to go to Tashkent and I feel like I sort of did with you! Thank you thank you! I also have a blog about food but I mix it with my love for languages. I have 2 http://thelanguagechef.com/tlc-blog/ the TalkingLanguage FB page . I love languages and food too. Again, thank you so much for your blog – I’m a new but BIG fan now! can you tell me about visa process. how u get the visa for multiple countries during the traveling and how you manage all this things. i love your channel and your videos. Uzbekistan looks like such a beautiful and interesting country. I have yet to visit any of the Stan countries but hope to visit that part of the world soon! wow wow can’t really find words to describe these massive foods and excellent photos. excellent work as usual Mark and thank you so much for sharing. hope you and family enjoy and have a nice pleasant for next trip. I am following your website regularly and this article was very informative……. Man – dying to go to Uzbekistan! Awesome pictures, the food looks amazing! I lived in Uzbekistan for 2 years and the Uzbek hospitality is something I’ll never forget. This post is timely as we plan to visit next year so now we have a list of foods to try and places to add to our list to visit. The Kalyan Minaret looks beautiful, as well as your hat. It’s also fascinating the foods you have showcased, how some of them transverse other cultures as well, like the dumplings. This is such a nice and informative blog, thank you for sharing this blog keep sharing. Thanks a lot for sharing the highlights. I have a plan to visit Uzbek someday. It would be great if you share more details on the trip. Like place to visit, safety, trasport and hotel. It’s alwasy been pleasure to follow your trip. Keep it up. Was not very familiar with Uzbekistan before reading this post but it looks like a fascinating country. The buildings in Samarkand and Bukhara are beautiful. Amazing! Thanks for sharing these wonderful experiences. Great food videos but you have really not explored Mumbai completely, you should do that. Did you eat the eyeball? Thank you Neil, no not this time! clean everywhere! love to visit next time. You are really good Mark! Thank you for making all of your videos. It makes me feel that I am in that place too. For the foods, just imagining the taste according to your description. Good job Mark. Mabuhay ka! Hi Rona, you’re welcome, thank you for your amazing support. So cool to hear that Silvia, hope you have an amazing trip. 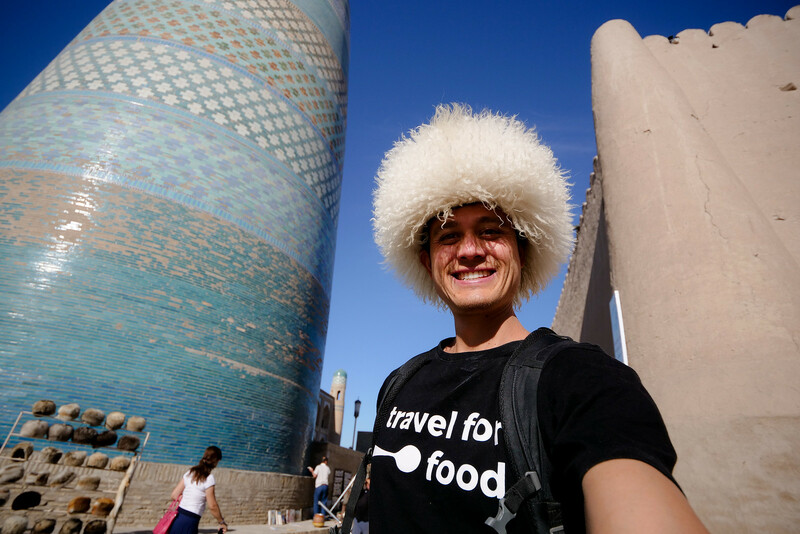 Thanks a million Mark & the Team for sharing food travel pics and news from Uzbekistan – Yum brilliant !!! Love your enthusiasm Mark—this is definitely a part of the world that is largely off the radar. Certainly off mine! Keep’em coming. Thank you David, it was really a learning experience for me too! What an interesting post! I would not have thought of visiting this country until now, the food looks fantastic and love the architecture of these old buildings. Thank you for sharing. Thank you so much for sharing the food in this country. It helps me to understand more. You’re welcome, thank you Joseph. Thank you very much for sharing your fantastic experience. I would LOVE to visit. Let’s set up the tour as many from the west are not sure if it is safe for tourists. Thank you very much Ru, it’s an amazing country to visit. Great report, I would love to go there. Wow, food looks so amazing, especially the lamb dishes. Thanks Mark for bringing attention to a place we seldom hear about. Looks like you had a great time and as always it was probably way better than you expected. Thank you for reading Analila! An amazing trip! Can’t wait for the video. Safe travels. All the best. Very lovely Mark, beautifully documented. Years ago I hosted a businessman and his wife at our home in Connecticut from Tashkent. Very interesting people. exciting and magical trip.scenes were exciting.cuisines looks delicious.how l wish l was with you l enjoyed your trip,till next trip…keep coming.take care and God bless you. This place looks unique. I have seen some STAN countries in youtube. Your pictures are lovely. I am glad to know that they took care of you well. Hi Mark: It is the first time that I notice that you mixed in with the local people. You look like the local people. You did not stand out in any way. If I did not know you from your earlier work, I would have thought that you are from this country. Amazing trip.!!! I am not a meat eater but looking at the pictures ….yummy, but still fish and veggies are my favorites. Sorry I missed a couple of your trips as I had been sick and hospitalized for 2 month and still not well. Please, keep on sending me emails and pics of your interesting trips. Willy. Hi! Mark, your article was very informative both in terms of the different cities it’s history as well it’s culinary delights. Looking forward to visit the places. Thanks for the same. Great to see your trip pictures and descriptions that we will never have the opportunity to visit that part of the world. Hi Mark. Another great report from far away country. Thank you for sharing. Can’t wait to visit the country. Hello Mark, I enjoyed every picture and word! So amazing to see places and peoples of the world!!! Hello Mark, l enjoyed every picture and word so amazing to see places and peoples of the World. Thank you so much Mark for these insights on Uzbekistan which we know so little about, besides a few historical facts! It goes on the must visit list! ❤️❤️❤️ as always. Never been there but maybe one day soon. All the – stans countries have such remarkable cultures that most of us in the west no so little about. Thanks Mark for givingus a view ! It’s the first I’ve seen of this country, it’s nice to see the presentation they have for dishes, huge fish they can cook up for you, such a treat. SUCH A DELIGHTFUL AND INFORMATIVE CULINARY/CULTURAL SHOW. THANKS FOR SHARING. Seems very nice people and obviously delicious food. Great snaps captured. Interested to visit in future. Thanks for sharing wonderful information. Looks fabulous and not anywhere I had thought of traveling to. Are there travel agencies specializing in this area? It certainly looks like an interesting country, full of history and the food looks simply devine. hi ,it is very clean in the market,in the city,people vey nice,food is similer too turkist food,your son is growing up and he will be big in the future and you will be happy. I enjoy reading your trip report, always inspiring. Cant wait to see the youtube video. Keep traveling! Thank you very much Muhamad! Really appreciate your kind support Sujata!